Goal-based Leadership explores the strategic roles of a manager: how to act on trends and events; engage and communicate with key stakeholders; set your own goals and drive changes; analyze and report on performance and adjust your decisions and actions on this basis. 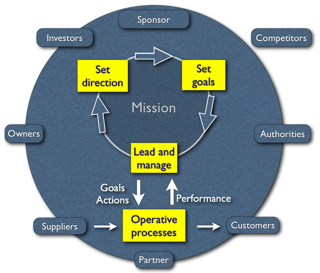 Goal-based Leadership is an efficient management approach to deliver strategy. - Read more in our White Paper. Most managers focus their skills, efforts and time on operational, business-as-usual, tasks; whilst these are important for the smooth-running of any business, modern organizations need their managers to do much more. They need their managers to handle their business-as-usual activities and, at the same time, drive the strategic activities that are such a fundamental part of survival in the rapid and ever-changing business environment. You can use your Management Team far more effectively if you learn to share and delegate strategic tasks and act through your goal drivers and relationship managers. Many management models and methods are not efficient to apply for managers working in a highly competitive environment of 21th century. Learn more about the shifts. Top-down approach in goal setting. Goals are cascaded from the top and a subset of goals is identified from the bottom. This leads to a hierarchy of goals. A new approach in goal setting based on empowered Management Teams working in networks driven by their own mission and own insight. Carried out on all units/levels of the organization in parallel. Goals identified are based how the Key Stakeholders (Interested parties) evaluate the organization's performance and capability. Go beyond to find your way forward!